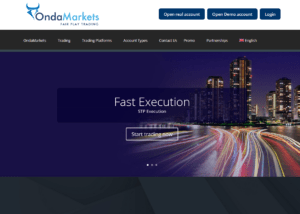 OndaMarkets Review 2018 | Is OndaMarkets a Scam or Legit Forex Broker? Beware OndaMarkets is a Non-Regulated broker. It is NOT SAFE to trade. OndaMarkets is a Forex and CFDs broker owned and operated by OndaMarkets Ltd., a company registered in St. Vincent and the Grenadines. St. Vincent and the Grenadines is a popular destination for forex brokers, as it has low taxes policies and the business registration process is simple. Usually, such brokers are not regulated in any country and are suspected in fraudulent activities. Also, very often unregulated offshore brokers are banned by the authorities who try to protect investors from losing funds. The first thing the potential investor should do when he is choosing a trading company is to determine if it is a legitimate broker or a scam broker. It is very easy to do. You just need to check if the broker is licensed by CySec in Cyprus, or it is under the regulation of the MIFId in the European Union (EU), or it is registered with the UK’s FCA or Australian ASIC.